Late November we had the third and final visit of the year of a group of veterinarians from Australia who, along with their students, have made it their mission to treat and care for the often forgotten ponies of Gili. In collaboration with the Gili Eco Trust and Horses of Gili, the veterinarians come to the Gilis three times a year to raise awareness, provide education and to run clinics. The clinics run for several days in Gili Trawangan before moving to Air and Meno. Through word of mouth, the owners inform each other of the upcoming visits. The primary objective is to convince the owners to sign up for all treatments (dental, wound care, worming and vitamin injections) which is no easy feat since dental work which includes deep teeth and gum cleansing can take at least half an hour to hour and most owners don’t want to lose that much time during their working day. Not all ponies are lucky enough to have a committed owner willing to give them the time to get all of the treatments so some only get their wounds tended and off they go. During this visit, the vets treated about 80-100 ponies in Gili T alone and another 40 in Gili Air and Gili Meno, respectively. Vets treated acute and chronic wounds from dermatological diseases to muscular and skeletal issues caused by the heavy harnesses that they carry. In addition to the treatment, the vets also educate the owners about proper diet, riding techniques and equipment fixes that can mitigate some of the injuries the ponies sustain. 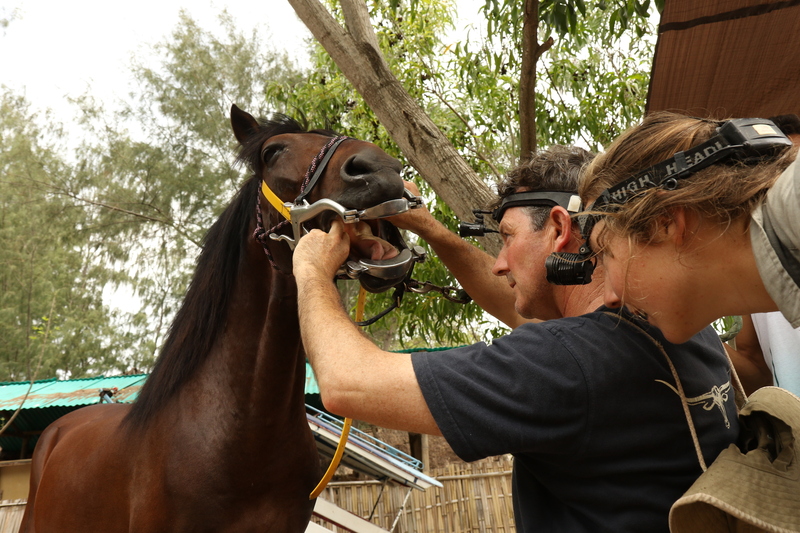 The vets often see chronic injuries to the area around the mouth that is caused by the constant jerking and pulling on bits and bridles that they use. Through generous donations from stables across Australia as well as donations that are raised by Gili Eco Trust, the vets are equipped with the all of the medicines they need to provide treatment as well as bits and bridles which they replace on each horse in order to prevent further damage. It is important to get the owners on board and help them understand that implementing some of these changes will give their ponies’ healthier lives which translate into their being able to work longer. In addition to the time Gili Eco Trust contributes its time to assist the veterinarians in their clinics, it also donated new padding which was fitted to each of the horses that came to the clinic. While they could not cure all ailments, the clinics were still a welcome respite for the horses of the Gili Islands. We thank all the businesses that donated accommodation to these voluntary vets and their assistants during their stay on the island. ← Gili Triathlon – winners all round!